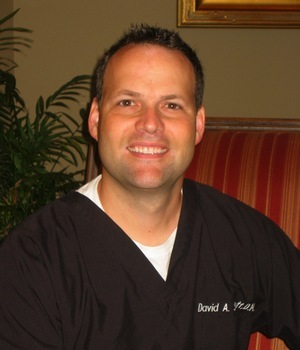 Dr. David A. Scott received his Bachelor of Science degree in biology from Birmingham Southern College and his doctorate in dental medicinea from the University of Alabama School of Dentistry in Birmingham. Upon graduating as President of his 1995 dental school class, Dr. Scott commissioned as a dental officer in the United States Navy where he served as Clinic Director at Marine Corps Air Station El Toro in Orange County, California. Dr. Scott and his wife Sonya Coleman Scott returned home to Alabama in 1998 which allowed them to live closer to their families and friends and to pursue their dream of opening their own private practice. Dr. Scott is an active member of The Academy of General Dentistry from which he received his Fellowship in 2002 in Honolulu, Hawaii. The Fellowship Award is one of the milestones in the most rigorous continuing dental education programs offered today. Dr. Scott was the only dentist in the state of Alabama to have received this award in 2002. To earn this award, Dr. Scott completed more than five hundred hours of continuing dental education courses and passed a comprehensive written exam given by The Academy. In addition to the Academy of General Dentistry, Dr. Scott is also a member of the American Dental Association, the Alabama Dental Association, the Sixth District Dental Society of Alabama, and the American Academy of Cosmetic Dentistry. Dr. Scott is also a graduate of the Las Vegas Institute for Advanced Dental Studies, (LVI) the world’s premier post-graduate dental teaching center for cosmetic dentistry where he continues to enhance his education. Dr. and Mrs. Scott have two children, Ella Claire 14 and Andrew 12. In their free time, the Scotts enjoy being together outdoors. Dr. Scott’s hobbies include golfing, mountain-biking, traveling, attending regional sporting events, and participating in locally sponsored activities. The Scotts are founders and contributors of the University of West Alabama Scott Student Research Scholarship. Dr. Scott is currently serving on the Board of Directors for the Alabama Academy of General Dentistry.